Ice out on Big Wood 2010 was April 19th at 3:30pm. We have a winner for the 2010 Ice out contest. Matt and his 2 children will get a 50% off one day for their 1st summer visit…which they already have booked. Congratulations Matt! Other Ponds in the area are not out yet but maybe by next week. Is the Ice out yet for 2010? NO 🙁 it is not. 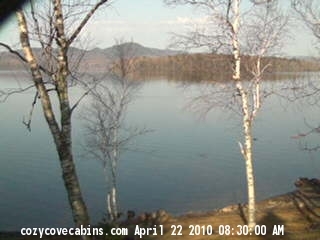 When you view the webcam, it may seem we have some open water but ice is not out yet and y 🙁 u still have a few more days to choose your date. Temps at night are still well below freezing so if it warms a little or we get some big winds…. 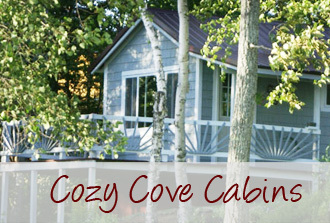 Due to a technical issue, the webcam at cozycovecabins.com may or may not upload correctly. We are waiting for a part so in the meantime, we do apologize for you lack of consistent viewing pleasure. (I sound like an airline stewardess 😆 ) Thanks for your patience. For those of you wanting to cast a vote for ICE OUT, when the cam is not uploading, I will try to post what we see. Today, the ice along shore is getting a dark color; means it is getting thin. But the rest of lake still is solid.